In the match preview directly following this game last March, I wrote, "horrible losses have a way of helping the lunatics come out of the woodwork while even the sane ones run the risk of jumping off the deep end." You get the sense that that vitriol has been bubbling under the surface all of this season. The high of last year's FA Cup victory and comprehensive capture of the Community Shield has worn off, replaced by a disheartening reverse in Dortmund, a quick exit from the League Cup, and draw after draw after draw. Arsenal may still be unbeaten in the league, but they haven't shown much panache in those six games. Which brings me to this weekend's opponent, Chelsea, who seem to be comprised entirely of panache right now. Throw in the psychological advantage that they're certain to have in this fixture and this looks like an insurmountable task for Arsene Wenger's red and white army. But, games aren't played on paper, they're played inside televisions on 14th Street, as far as I can tell. 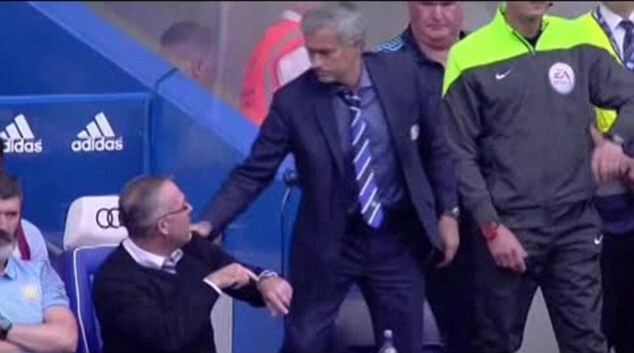 You'll recall Jose Mourinho went unbeaten for a very long time at Stamford Bridge, to the tune of 78 games. Nobody could have predicted before April 19 that it would be Sunderland who broke the streak. All that said, I would absolutely rip your hand off for a draw. There are no changes to the injury list after Wednesday night, at least at the time of my writing this. Arsenal will get a wealth of players back after the upcoming international break, so at least there's some relief on the horizon? Maybe? Jack Wilshere should be available to start after coming off the bench midweek; there had been questions surrounding his fitness after rolling his ankle in the North London derby last weekend. So now, the question is tactics. Arsenal were burned many times on the road last season for being opened up too easily, never worse than at the Bridge in March. Logically, that should mean focusing on a more defensive shape this time around. Given the few available players at the moment, that would mean having Mathieu Flamini and Jack Wilshere sit deep. I'd have Mesut Ozil play centrally, otherwise the media will froth at the mouth the first time he doesn't track back fast enough on a wing. That said, you'll need to have pacy wingers that can put in a shift up and down the pitch; I'd lean towards using Alexis Sanchez and Alex Oxlade-Chamberlain for these roles. Make sure the Ox doesn't use his hands or look too much like Kieran Gibbs. Aside from that, the rest of the XI picks itself. Predicted XI: Szczesny, Chambers, Koscielny, Mertesacker, Gibbs, Flamini, Wilshere, Ozil, Alexis, Oxlade-Chamberlain, Welbeck. Matic had the game's only goal on Tuesday. Chelsea have just two injury concerns, compared to Arsenal's eight, as Ramires and Didier Drogba are both out until after the international break with groin and ankle injuries, respectively. Drogba tried to return too quickly from his ankle injury last weekend, then announced on Monday that he had reaggravated it in training. With these injuries in mind, Jose Mourinho will not likely make any changes to the XI that started against Aston Villa last weekend. That includes, as you know, former Arsenal captain Cesc Fabregas in the deep-lying midfield role alongside Nemanja Matic, who himself scored against his former club in Europe this week. The only real question then is between Andre Schurrle and Willian in the attack and whether or not Diego Costa's hamstring has fallen apart yet. Predicted XI: Courtois, Ivanovic, Terry, Cahill, Azpilicueta, Matic, Fabregas, Oscar, Hazard, Willian, Costa. The roller coaster ride that is the 2014/15 Arsenal season continues. The Gunners were comprehensive in their win over Galatasaray, but that does not say much about how Arsenal will handle a team more consolidated in defense. Remember, they're just one week removed from only putting one past a struggling Spurs side. As it stands, Arsenal's 3-0 win at Aston Villa remains the club's only road victory this season, in five matches. As for Chelsea, well, they still have not lost at all across all competitions. The last time Chelsea suffered defeat was April 30, at the Bridge, against Atletico Madrid in the Champions League semi-final. Since that point, they've played eight league matches, drawing two (one this year, one last year) and winning six (five this year, one last year.) They've played two European matchdays, drawing Schalke at home and winning at Sporting CP on Tuesday. They've bounced Bolton Wanderers from the League Cup as well, earning a fourth round date with mighty Shrewsbury Town in the process. year. Here are some cartoon balloons instead. In a span of 17 minutes, Arsenal were down 3-0 and down to 10 men, with the wrong man given marching orders. To recap, Samuel Eto'o opened the scoring in the 5th minute, then Andre Schurrle added another just two minutes later. Eto'o then proceeded to injure his hamstring and I briefly thought "well, maybe that'll take some of the sting out of their attack." Then, Alex Oxlade-Chamberlain handled a Eden Hazard shot that was already going wide, Kieran Gibbs was sent off in error, and Chelsea converted the resulting penalty. You may recall that the red card, in itself, was the wrong call because the shot was not on target, a penalty and a yellow would have been correct; this was confirmed as neither Gibbs nor Oxlade-Chamberlain served a ban as the card was rescinded. Oscar added the fourth just before halftime, then picked up a brace in the 55th minute. He was then removed for Mohamed Salah, who scored Chelsea's sixth (and his first with the club) just three minutes after coming on. All in all, a farce from top to bottom for the boys in red and white. The other match between the sides last season was a bore draw at the Emirates just before Christmas. Since 2004, Arsenal and Chelsea have met 24 times across all competitions and Arsenal have won just four of them. It's also well established that Wenger has never beaten Jose Mourinho, drawing five and losing six. Arsenal's 5-3 win at the Bridge in 2011, which comes up again just ahead in this preview, is their only win at Stamford Bridge since 2008; that's not that bad, all things considered. Arsenal actually have more wins over the last six seasons at Stamford Bridge than they have at White Hart Lane. There are many like it, but this one is mine." The referee is West Yorkshire-based Martin Atkinson, who worked this corresponding fixture two seasons ago. Of course, you can't really compare a referee's decisions across seasons, even in corresponding games; for example, consider that Andre Marriner, who you'll no doubt recall worked this game last year, was in charge of Arsenal's 5-3 win at the Bridge in 2011. Back to Atkinson, though, and two early decisions in that match in January of 2013 went Chelsea's way: a foul in the buildup to the first goal and a soft penalty (I think?) made it 2-0 to the home side within a quarter of an hour. Unlike last year, Arsenal fought back, and pulled a goal back through Theo Walcott around the hour mark. 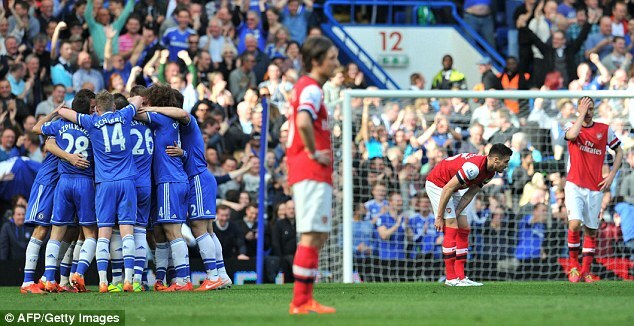 Arsenal pressed and pressed for an equalizer that never came and the Gunners settled for a 2-1 loss. This is Atkinson's first match of the season for both sides. Last year, Arsenal had a record of two wins and two losses with Atkinson, with both of those losses being among Arsenal's four road capitulations (6-3 at Manchester City and 3-0 at Everton.) He was, however, in charge of Arsenal's 2-0 home win over Liverpool in November and the 3-1 win over Sunderland in September, in which Sunderland should have been level at 2-2 when Bacary Sagna fouled Jozy Altidore; Atkinson chose to blow his whistle and give the free kick instead of playing the advantage on which the American scored. Chelsea, meanwhile, had a record of two wins and a draw with Atkinson last year; all three were road games. The Blues drew 0-0 at Old Trafford in a cautious match in August (before anyone realized how crap United was going to be under David Moyes) and later won 3-0 at Southampton on New Year's Day and 2-0 at Liverpool in April, thanks in part to Steven Gerrard's tumble. Atkinson may be just as fatigued as the players for this one; he too was involved in the Champions League, as the referee of Bayer Leverkusen's 3-1 win over Benfica on Wednesday. On the issue of red cards, Atkinson has not sent a player off since Boxing Day, in which he sent off two Stoke City players in the span of four minutes. 9-man Stoke, up 1-0 at the time of the cards, then fell to Newcastle 5-1.